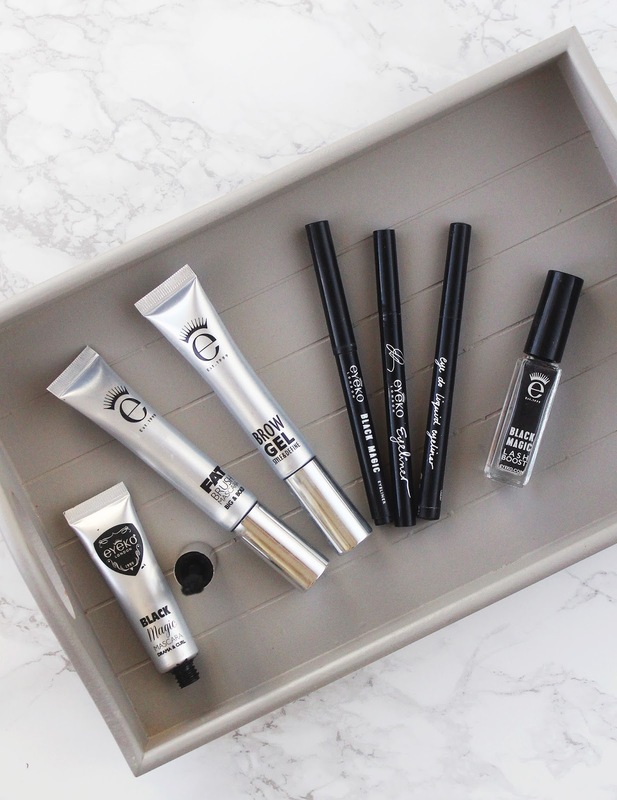 If I had to sum up the brand Eyeko in three words, I'd say: stylish, trustworthy, expert. 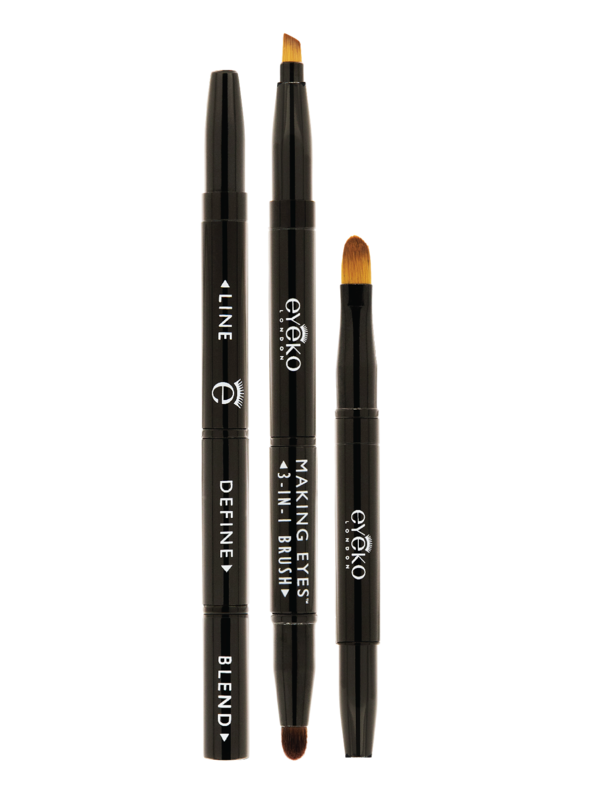 Eyeko makes specifically eye make up (hence the name), from their eyeshadow sticks to their range of six mascaras. The fact that the brand has kept it's focus very specifically to all things eyes, means that they've gone above and beyond what other make up brands have to offer in the eye department. 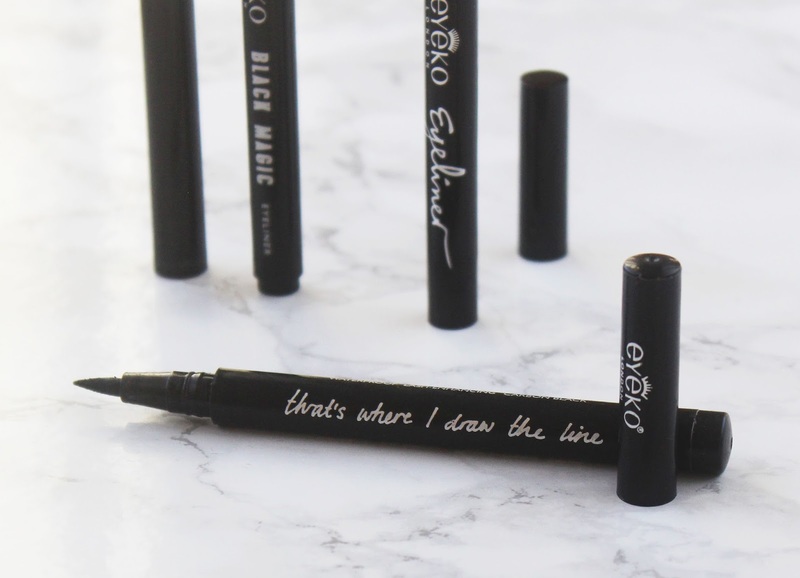 Not only that, but Eyeko has worked closely with style icon Alexa Chung, and the stylish-ness and edgy creativity shines through all their products (at least the ones I've tried anyway!). 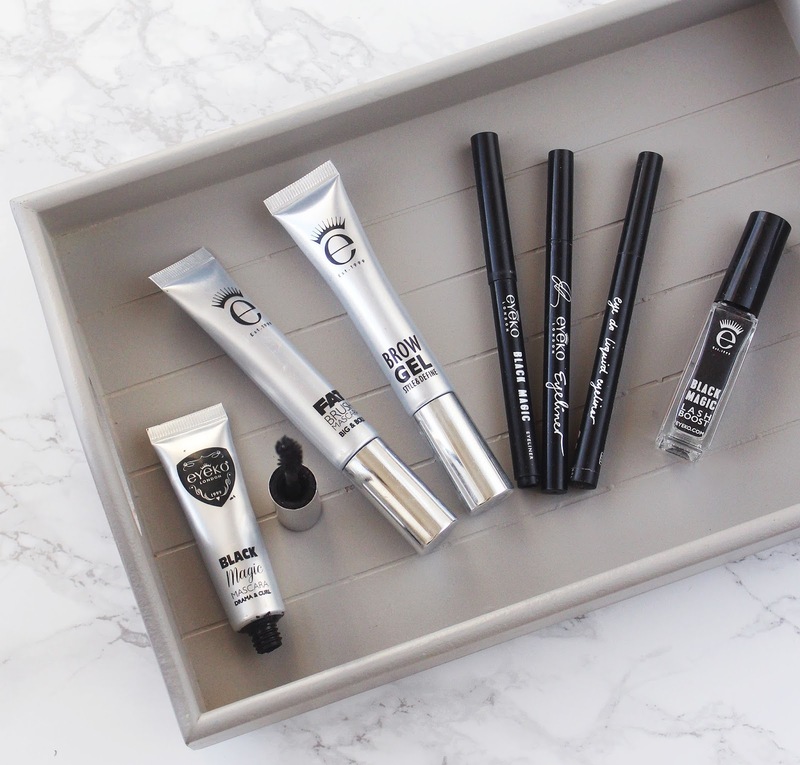 I am a huge fan of Eyeko and my collection has expanded quite a bit now, so I thought it was about time I gave them a special spot on the blog. This is my favourite, favourite mascara literally ever. I love everything about it - from the curved shape of the wand that just hugs the lashes, to the way it lifts and curls the lashes. I'd definitely say the curling aspect is it's forte. It makes your lashes look big and fluttery in a way that looks very natural, rather than spidery and clumpy. You can see this mascara in action in my latest photo shoot with Ellis. This mascara is newer to me, but I've been loving it so far for adding a bit more drama to my lashes. It thickens my lashes with just one coat from root to end. It's great for lengthening, too - lifting my lashes right up and keeping them there all day. This one is a particularly good pick for long wear, as it's budge proof and water resistant. I am blessed with naturally long, curly lashes. So something I really look for in mascara is something that's going to make them looker thicker and fluttery. 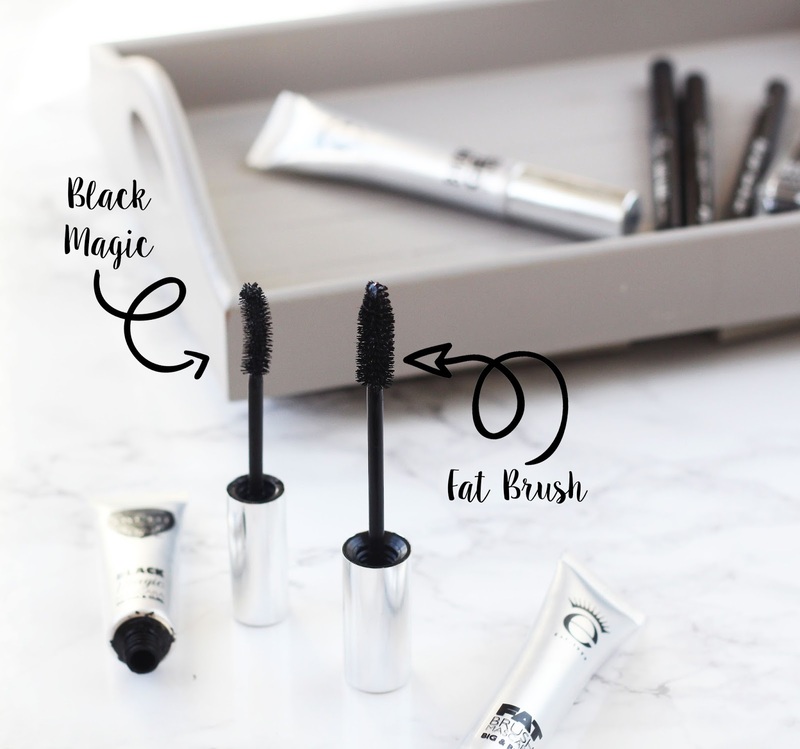 These are mini lash fibres that brush on just like a mascara, adding thickness and volume. For me personally I love that they pack out my lashes and give them almost a false lash quality - it makes them fat and fluffy looking! And I mean that in the best way possible. I love that this is a very customisable product - you can layer it under and over mascara, and sandwich lots of layers if you choose to, to get maximum impact. The only thing I will say about this product is to make sure you apply them before your base make up unless you want fibres sticking to your foundation! These are glossy finish eyeshadow sticks. I love how big and chunky they are, it just makes it that much easier to apply a sheen of colour to the eyelid and go. They're brilliant at adding a quick wash of colour - absolutely perfect for girls in a rush. Because they don't have the opacity you might expect from a matte cream eyeshadow, you can be a bit more messy with them without it showing too much. You can see swatches of the colours I have here. This brilliantly versatile brush has a flat shader, smudger, and an eyeliner brush. This brush is a favourite of Mary Greenwell, and I can see why. They're all really good quality, pick up and put product down really well, easy to clean - this is a tool that quickly became a must have in my make up bag, especially for travelling. This doesn't seem to be available in this formula anymore - so I won't talk too much about it. The one I have is a gel pencil and I love it for tight lining, as well as for drawing a quick mini-wing. It's so creamy and blends beautifully, I wish this formula had stuck around. 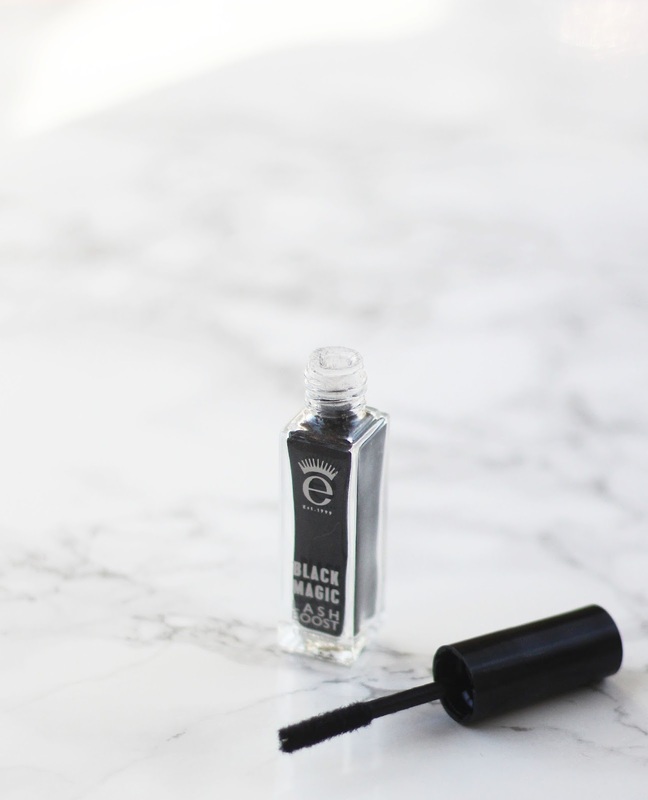 This guy is a felt tipped liquid eyeliner, and is a favourite of Alexa Chung. The tip is quite stiff, is tapered to a very fine point, which makes it very easy to control and draw a precise feline flick. I'd suggest a felt tip eyeliner to people who are new to liner in general, because they're just that bit easier I feel. 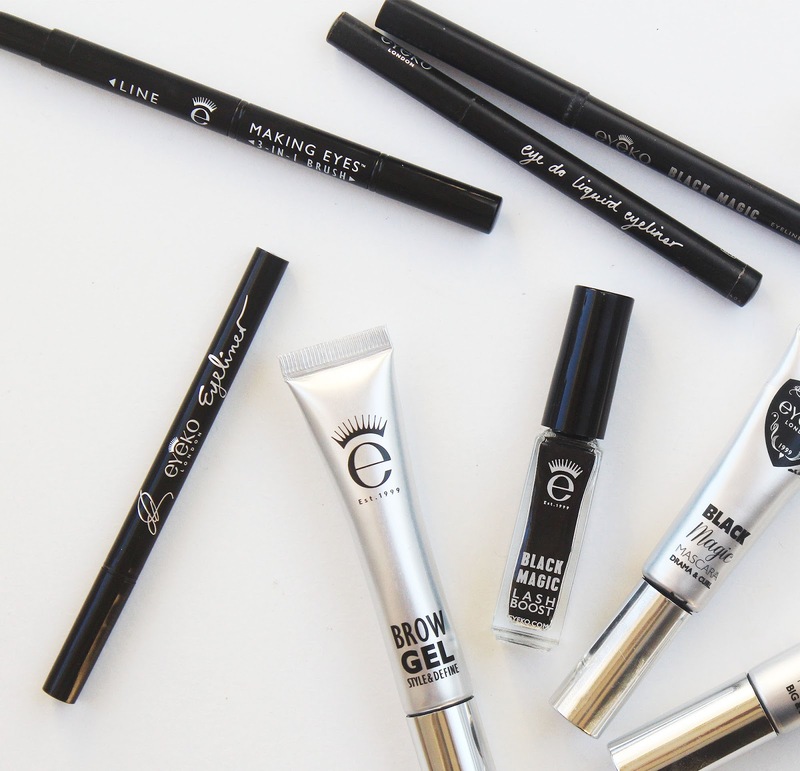 It's as black as black can be, so is perfect for dramatic eye looks. Plus, its waterproof and contains lash enhancing ingredients to promote lash growth "within 15 days". I'd be lying if I said I noticed a difference, but I don't wear this eyeliner every single day. I can only find this available in this gift set. This is another liquid eyeliner, but it differs to the Eye Do option in a handful of ways. For starters, this formula is a little more on the watery side, but it dries down to a matte finish. Secondly, it has a tiny, thin brush applicator. 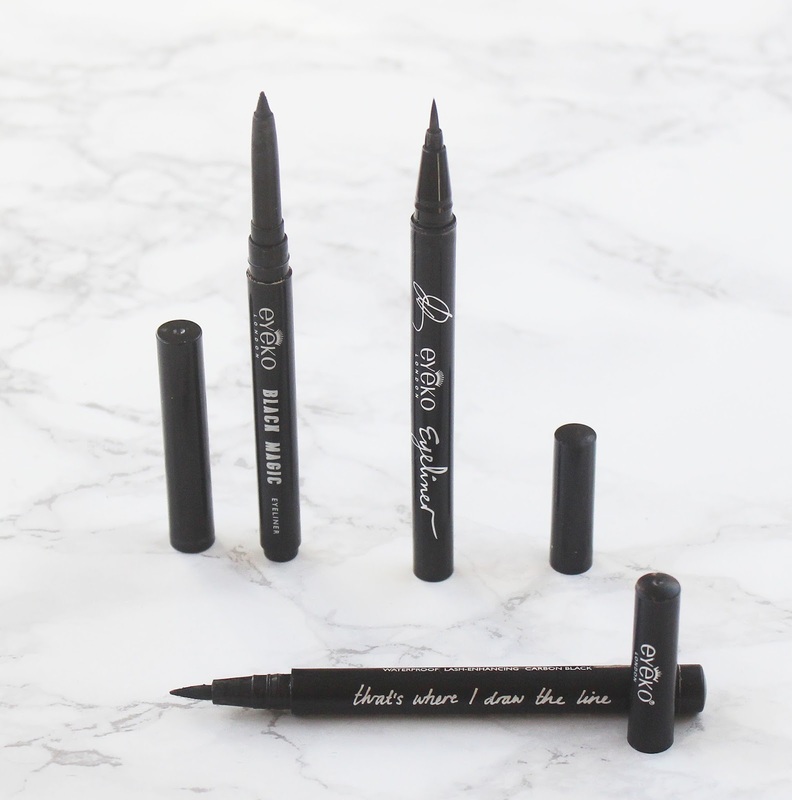 I'd say this is for people who are a bit more advanced when it comes to eyeliner, as the slim tip requires a little bit more of a steady hand. However I'd say this is my personal favourite because I just prefer the more liquid-y formula, and having a bit more control over the shape of the wing I'm drawing, because the brush is a little more flexible than a stiff felt tip. Finally, the brow gel! This is a very pigmented brow gel, but the consistency of the formula is very watery, so I find it easy to sheer out by using a light hand. I just brush it very gently across my brow hairs in order to make sure everything looks filled in, but also natural. Unlike a lot of brow gels, this doesn't dry down to a sticky, crumbling texture, it still feels very soft to touch even when its dry. But it holds my brow hairs in place all day long. You also get a lot of product with this brow gel (8ml), so this is a great pick in terms of value for money. 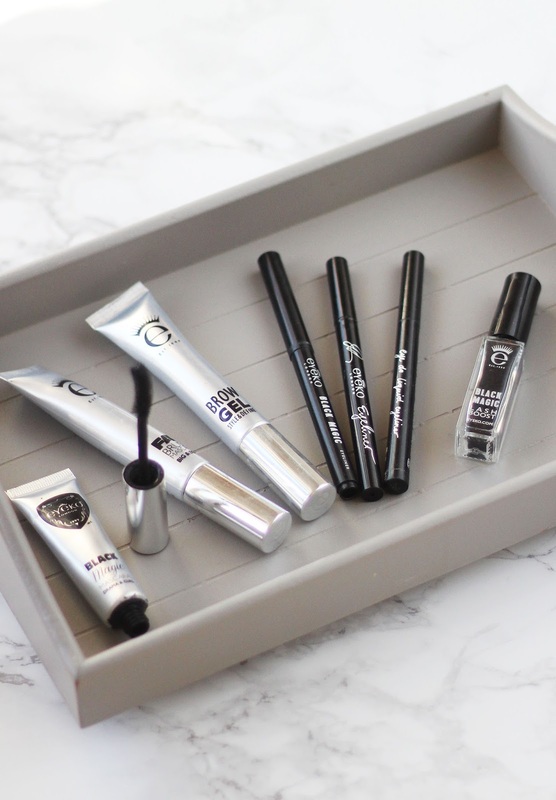 My favourite thing about Eyeko is that it's all really reasonably priced, especially if you shop directly at Eyeko.com, where there's often deals and discount codes available. Plus they have a lot of gift sets and collections which will save you a lot of money, rather than if you buy the products individually. 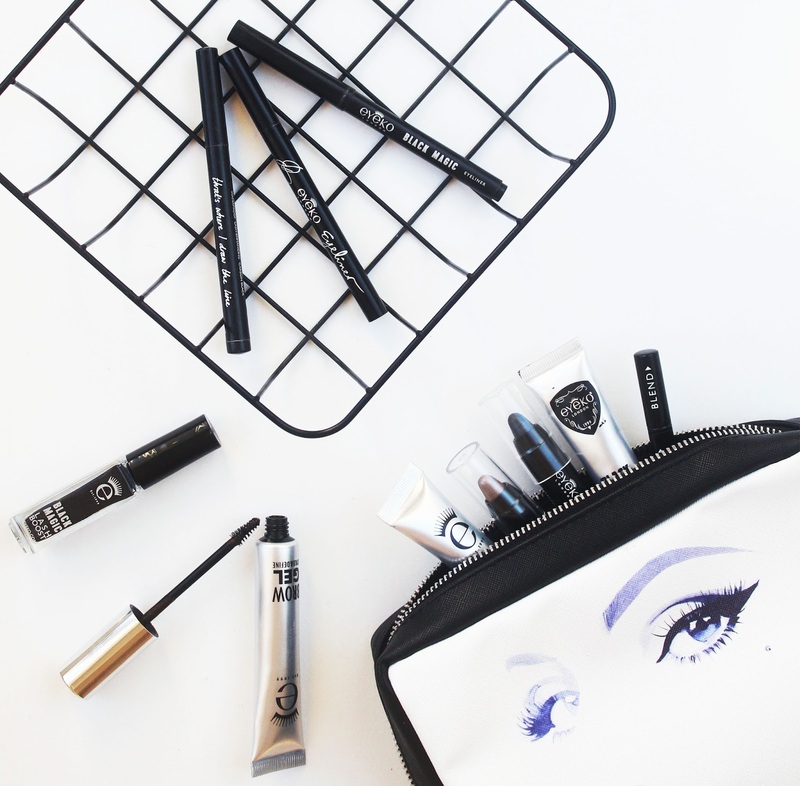 What are your Eyeko favourites? Oh wow! I never heard of this brand before.